PARIS -- PSA/Peugeot-Citroen SA predicted that Europe's auto market will continue to decline in the wake of the sovereign-debt crisis after its car sales in the region slipped in 2011. PSA sold 6.1 percent fewer vehicles in Europe last year and its market share fell 0.9 points to 13.3 percent as the 207 subcompact "came under stiff competition," the carmaker said on Thursday. PSA's worldwide sales declined 1.5 percent to 3.5 million vehicles even as the auto market expanded by 3 percent, it said. The results "reminds us what can, and most likely will, go wrong in 2012," Erich Hauser, a London-based analyst at Credit Suisse, said in a note. Expansion in emerging markets could not offset a decline in Europe. PSA's sales grew 10.6 percent in Latin America, 7.6 percent in China and 34.8 percent in Russia. The proportion of PSA's car sales outside Europe expanded to 42 percent from 39 percent in 2010 as the automaker chases growth in emerging markets and aims to give its brands a more global presence. The automaker this year intends to introduce four new models including the 208, a 207 successor, and six restyled vehicles. PSA is seeking to boost the value of it brands by focusing on more expensive cars after increasing the proportion of "premium" vehicles to 18 percent in 2011 from 13 percent a year earlier, it said. The upmarket models include the Citroen DS line and the Peugeot 508. PSA expects the European car market to decline by 3 percent this year, with the drop slightly more pronounced in the first half of 2012, head of brands Frederic Saint-Geours said on Thursday. The car market worldwide should grow between 3 percent and 5 percent, thanks to growth in markets like China, Latin America and Russia. PSA kept its target of achieving 50 percent of sales outside Europe in 2015 and two-thirds in 2020. The group warned in October that its core automotive division would likely post a loss in 2011 and, in a move to focus on its rebranding, appointed former finance director Saint-Geours as head of brands. 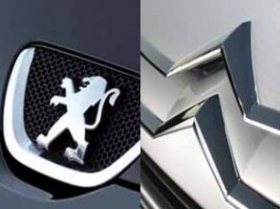 "In 2011, the situation in the European automotive market confirmed that our strategy of becoming more global and moving the Peugeot and Citroen brands further upmarket is the right one," Saint-Geours said in a statement. He expected to speed up implementation of the new strategy. "The group, like Renault, has clearly underperformed in its main market," CM-CIC Securities analyst Florent Couvreur wrote in a research note, calling Europe a burden for the group. "The outlook for 2012, particularly in Europe, does not seem to be inviting," he wrote. Couvreur forecast an 8 percent drop in the French car market, which represents 27 percent of group sales, in line with PSA's own outlook for the year. Reacting to speculation of a possible tie-up with Fiat, Saint-Geours said that the conditions for link with another carmaker were not right at the moment. "Our main shareholders have said: 'If it's necessary to develop the group to look at its strategic options.' We are ready to do that," he told French BFM radio. "It's just that this type of an alliance needs to meet certain conditions."